paying workers’ salaries before Christmas. Speaking on behalf of the governors, Rochas Okorocha of Imo State said payment of the arrears was dependent on the president’s approval of the payment of the 50 per cent Paris Club loan refund. 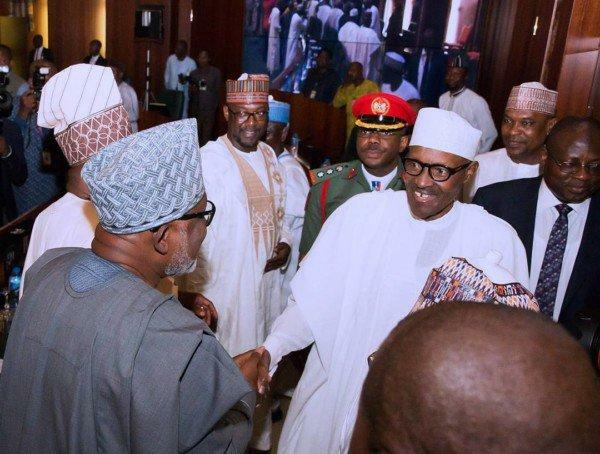 He said this while addressing State House Correspondents after the governors had a closed-door meeting with Buhari at the Presidential Villa, Abuja. Okorocha disclosed that governors would put pressure on the president to get approval for the balance so that they can make adequate appropriation arrangements. Confirming Buhari’s directive, Okorocha said, “Yes, with the Paris Club coming, every worker should enjoy his/her Christmas. “The president has expressed the need to make ensure that every Nigerian especially the workers have a beautiful Christmas and the issue of outstanding Paris club was discussed and that was taken care of. “We also made a request for Mr. President’s approval so that the balance should form part of our 2018 budget, because we can’t include it, until we are sure that the money is coming. That was also sorted out. “So, as it is now, the issue of workers took the centre stage and Mr. President was concerned about those who depend on their salaries to feed their families and pay their house rent and he had the assurance from the governors that we will meet up those obligations”.